On loan Ayr United winger Craig McGuffie hopes to make his mark with Raith Rovers – but admits he’ll need to win his place in the team first. The 21-year-old arrived at Stark’s Park last week and made his debut as a second half substitute in the 2-1 defeat to Brechin City on Saturday. It may not have been the start McGuffie hoped for, but he is relishing the opportunity to show what he can do in Rovers colours. “I’m buzzing to be at a massive club like this and just hoping to get some game time,” he said. “It’s been frustrating for me personally not really getting many starts this season so hopefully I can come here and impress. “I’m looking to get a run of consecutive starts but I don’t expect to just come here and get into the team. “The two wingers already here look really sharp so I’m going to need to battle in training. McGuffie has been a victim of Ayr’s success in the Championship this season, unable to break into a side that is going for back-to-back league titles. “We’re doing so well so I can’t exactly go and say, ‘put me in’,” he said. “I’ve just been plugging away in training and I’m buzzing the gaffer gave me a chance to come here, and hopefully I can do good things with Raith and try to get ourselves promoted. “I want to push on now and try to get goals and assists. I want to look at my stats at the end of the season and, for me, personally, and for the team, to have got some goals and assists. “It’s frustrating when you have a good game but you’ve not scored or assisted because that’s what most folk look at. 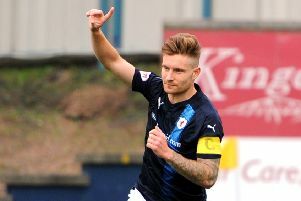 McGuffie played his part in ensuring Raith missed out on promotion last season, making 29 appearances as Ayr pipped Rovers to the title. “It was a rollercoaster,” he said. “Going into the last three games we only needed a win and a draw, then we lost to Stranraer and Alloa. “We thought we’d thrown it away, but then Raith slipped up. It was a great day, but I don’t want to speak about it here too much! “Everyone was expecting Raith to win and that probably put them in a bit of bad form going into the play-offs. “We can look at it more positively this season and prepare as if we’re going to be in the play-offs. I’ve spoken to the manager and he just wants to get up either way. “If it’s through the play-offs you’ll take it now, but I’m not going to say we can’t catch Arbroath because stranger things have happened. “I’ve only been with the boys for a couple of days, but the ability is there, and the detail the manager goes into for every game is brilliant. “He does video analysis – stuff we don’t really do at Ayr – so I’ve not really seen that.